Karl Marx and Friedrich Engels are regarded as the founders of the Marxist, revolutionary, socio-economical ideology called "Marxism." Their intellectual work was geared towards a global understanding of the socio-economic problems which seemed to originate within the human nature and organized societies. Such problems were prevalent in most governing systems of their time. The revolutionary aspect of Marx and Engels' ideology is centered on the notion that people needed to actively change the socio-economic system to a better form, instead of trying to preserve the existing status quo. Both Marx and Engels were born in Prussia, modern-day Germany, in 1818 and 1820 respectively. Karl Marx was the son of a Jewish lawyer who wanted his son to also become a lawyer and directed him to law studies. 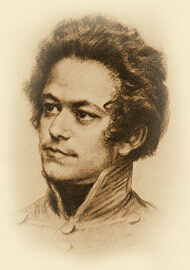 However, as a youth, Karl was more oriented towards philosophical issues which he pursued in parallel. Marx developed a critical eye for whatever was going on in society at that time, and used to write various articles and comments based on his views. In 1843, he went to Paris with the intention of publishing a journal regarding his ideas on social reform. The following year he met Engels and they both started participating in different groups that shared the same reformative views. They also started spreading their ideas on "Revolutionary Proletarian Socialism" or in other words, on "Communism." Through his interaction with Engels, Marx's love for revolutionary action was even more strengthened and as his beliefs combined with Engel's ideas, Marx became capable of penetrating the more practical social and economical levels of the governing systems. But the more he delved into the governing system of his time, the more he became critical of the system. The Paris government accused him of being a dangerous revolutionary and banished him in 1845. He went to Belgium, and together with Engels, he participated in a communism-support group which was called "Communist League" and wrote his famous work "Communism Manifesto." In 1848, he was banished from Belgium and went to London where he started writing "Das Kapital" the most widely-read critical analysis of capitalism. Marx stayed and worked in London until the end of his life in 1883. Friedrich Engels was the son of a textile manufacturer and cotton plant owner. Although Engels did not finish high school due to family hardships, he was keen to read the philosophy of Hegel - which affected him greatly. Later on, he attended various university lectures and interacted with other Hegelians. Interaction with Moses Hess led him to see communism as an evolution of the Hegelian thought. 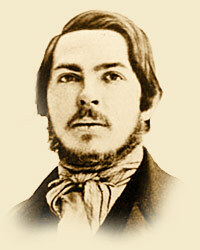 Friedrich Engels was deeply shocked when he traveled to England to work with his father who was an industrialist. Witnessing the unacceptable condition of laborers reinforced his communist ideals, contrary to his family's best interests. However, his family did not denounce him but rather sought to navigate him back to their line of less-radical thinking. Engels and Marx essentially started their cooperation in 1844, when the two men exchanged ideas and found that their co-operation was harmonious and their philosophies complementary. From that point onwards, they collaborated to issue a very significant amount of work until the death of Karl Marx in 1883, and even after that, Engels published two more of Marx's books. Engels died in 1895. It is noteworthy that both men showed early signs of radical thinking. Marx could become a successful lawyer like his father; yet, his life was won by the greater issues that plagued society to the detriment of his own financial well-being, and to such an extent that Engels often had to support him financially. Similarly, Engels could have lived as a successful industrialist, just like his father. However, he chose to pursue the same path as Marx, and due to his beliefs he practically lived as an exiled man in the margins of society. In a sense, both men lived their ideology as far as that was possible within the confines of a different social and financial system. On a more personal level Marx was married to the daughter of a Prussian baron. They had seven children, but only three of them survived to adulthood due to poor living conditions. Engels was in a relationship but based on ideological grounds he never married nor did he have any offspring. Undoubtedly though, the world has been enriched due to his and Marx's intellectual offspring. Marx and Engels' intellectual work consists of a plethora of books and articles. They were both excellent observers of the course of society and economy, which led them to analyze the existing social structures of their time. They systematically ripped apart the reasoning behind the organization, financial laws and social structure of the existing social system, highlighting the problems and proposing alternative revolutionary solutions that would solve them. This socio-economical complex of analyzed facts and trends, plus ideas and suggestions for a more functional system is now called "Marxism." At its core, Marxism maintains that there is a very unfair exploitative situation of the average workers -the proletariat- by the rich elite of the world, the bourgeois. This system of exploitation is becoming even worse by the people's unprotesting participation in it, because this way the system continues to produce more and more wealth for the elite that controls it. The poor are thus enslaved even more, because of the uneven distribution of wealth and the ever-increasing distance between those who own the capital and the workers who can only sell their labor. 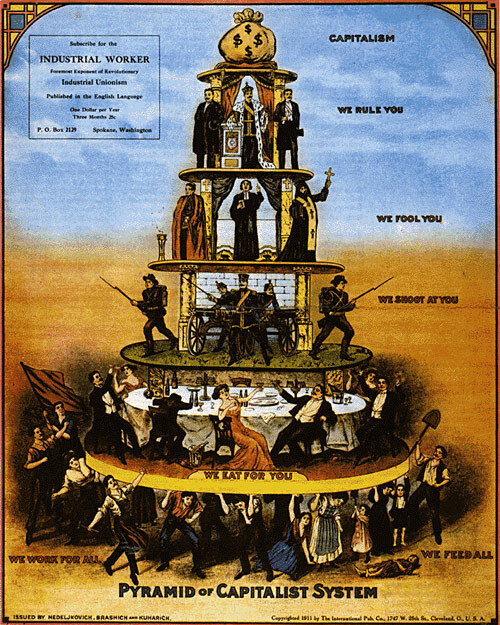 Marx and Engels tried to make people understand that this capitalist system is not profitable for everyone, but only for those few at the top of the pyramid who enjoy immense riches. These riches are a result of exploitation and owning immense capital allows the elite's perpetual dominance and the superior-inferior interactions in society. Marxism suggests that the system needs total restructuring. In order for this restructuring to become feasible, the inherent injustices of capitalism have to be eliminated. All forms of capital, and especially the critical infrastructure and production means such as land, factories or machinery must be distributed to the people by law. Moreover, prohibiting the ownership of capital ensures that no controlling mechanisms of exploitation can exist in the future by those who aim to accumulate excess wealth. When people share riches, all social divisions and all forms of differentiation will crumble, and humanity, instead of being divided in capitalists and workers, will be in a state of union through a de facto classless society. Marx understood that this reform was rather unrealistic to take place during his lifetime, and he only expected that this change would be done when there was a sufficient degree of social fermentation with people's active participation in this revolutionary idea. It is interesting to note that Marx also believed that religion served a useful role in suppressing workers. Finding comfort in religion to escape the misery of daily life, or having to pray to a superior being for hope was apparently preventing people from assuming full responsibility for their own life and changing it through revolution. In those countries where a communist revolution took place according to Marx's theories, a government which was supposed to act for the benefit of the working class was indeed established. However, while many 20th century communist governments claimed to act in the name of the people, they usually failed to govern with the interest of the people in mind. These governments ended up suppressing the people "for their own good." Many have pointed out that this is due to an inherent flaw in the Marxist and Communist theory which disallows it to be effectively applied. On the other hand, a more careful view shows that there are competing tendencies as to how Marxism can be effectively implemented in society or not. Marx and Engels left behind the Marxist ideology, which has practically touched everyone alive in the 20th and 21st centuries, not excluding people living in capitalist countries. Regardless of whether Marxism is applied today, capitalism made significant concessions in people's exploitation in order to be more worker-friendly, thus ensuring its image as a viable system that people do not really need to overthrow. On an ideological level, Marx and Engels also touched thousands of thinkers and leaders who then developed, adapted or combined Marxism with other ideas or practices. In a few cases, this led to the overthrowing of capitalism through revolution, while on the whole, it led to the development of a sizable worldwide communist movement. With their writings considered "essential reading material" for those who want to change the socio-economic structures of the world, it is certain that Marx and Engels will continue to be highly influential for years to come. It is not by accident that when the capitalist system is having "hiccups" their writings peak in readers' demand.